Maxi Game Poster: If you are a true gamer at heart and are ready to try out all the new, up and coming games, then Homefront is definitely one to try out. Produced as a video game for Xbox 360, PlayStation 3 and Microsoft Windows, this first person shooter game set in 2027 has been predicted to have a huge following, and a sequel has already been scheduled. Join the American resistance as the USA deteriorates due to the invasion of the Korean People's Army, who are armed with nuclear weapons. 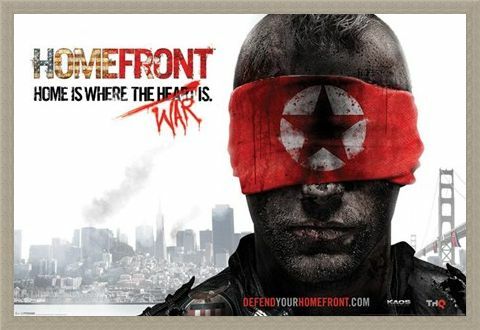 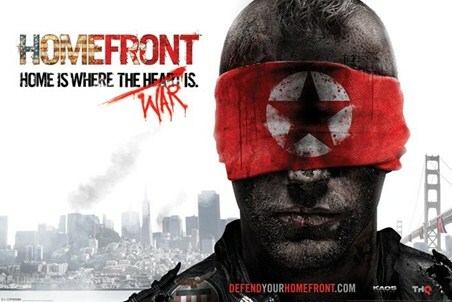 With a signature phrase of "Home is Where the War is", Homefront can be recognised as the game with the man in the red blindfold. So how about getting into the Homefront mode, and hanging this poster on your wall, ready to take on the fictional alliance of Eastern Asia. High quality, framed Home is Where the War is, Homefront poster with a bespoke frame by our custom framing service.